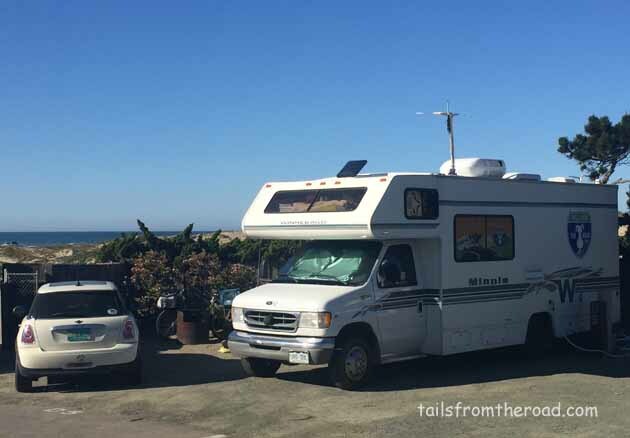 After 17 months of full-time RVing, my favorite place is the Central Coast of California. 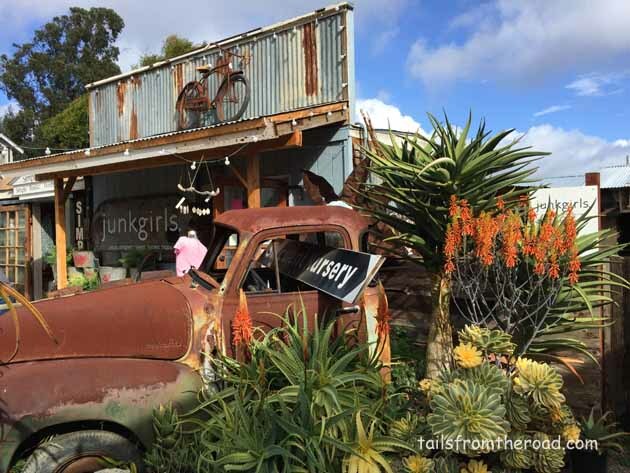 Here’s a great spot to stay and some fun things to do. Love this view out of my door! The spot is tiny, but when you hear the ocean 24/7 it’s just fine. The park has tiny camp spaces and the office people make you feel like you are doing them a favor to stay there. They are busy year round and make no deals at all. My first spot was the worst spot I’ve ever had, next to the restroom, so I moved to a space where I could walk through a gate, cross the little road, and the boys and I were at the beach. The only great thing about it is the location. I will be back, but would love to have some company next time! Want to come? Morro Rock, view from the camp spot. 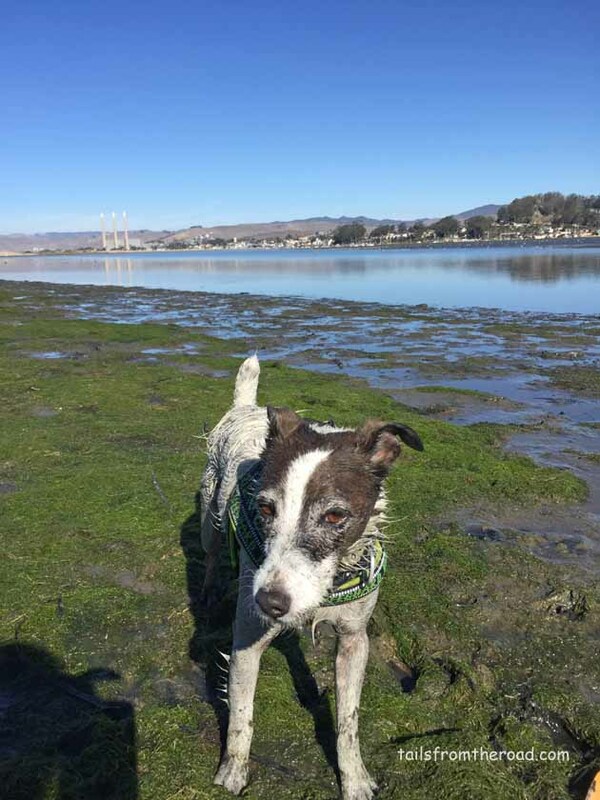 This private park is on the Morro Bay City Beach, which is dog friendly. There is a line/sign just to the north of the spot where the RV Park is on the beach, you are not allowed to go past this line with the dogs (it’s state owned beach). Walk towards the big rock (south). I talked with some locals and they said that it’s fine to have the dogs off leash if you can control them. 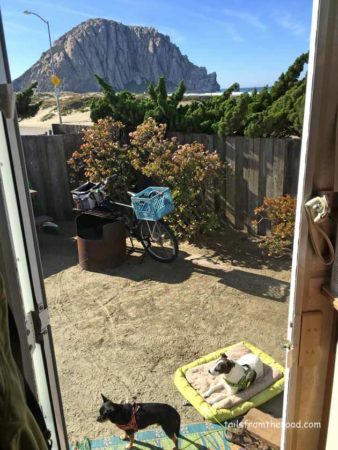 The actual Morro Bay is south of the rock, the RV park is on the north side of the rock, connected by the bike path. Big rigs to fit in to this park, it’s just a little snug. 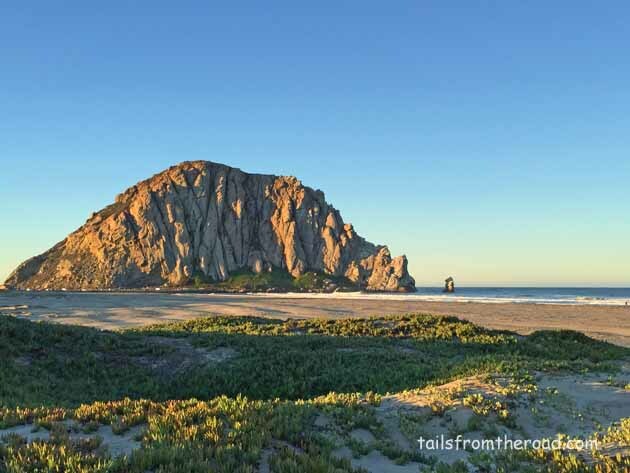 Get in your car and drive approximately 1 mile north of Morro Bay, past the last stop light, look for the pull outs on the beach side. This is “Dog Beach”. It’s unmarked and about 1 mile long. All the locals bring their dogs here and it’s a total blast. We only ran into friendly people and dogs, daily. Sunsets here are amazing. Dog beach, just north of Morro Bay. Dogs run free here, soooooo much fun! 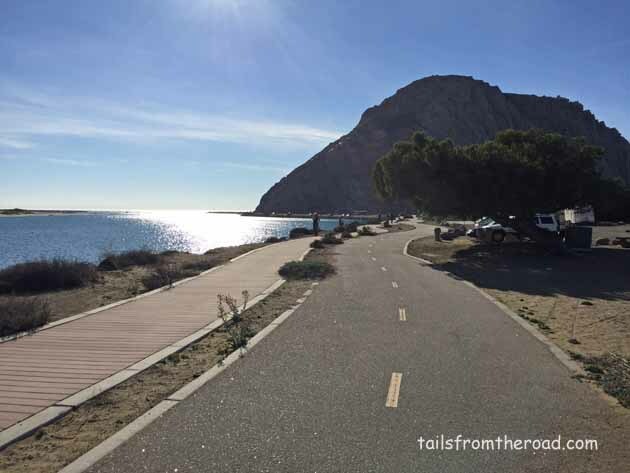 From the campground, you can walk on a beautiful paved pathway right to the other side of the big Morro Rock, to downtown Morro Bay, where there are otter pools, boat marinas, restaurants and shops. Cutest place ever!!! 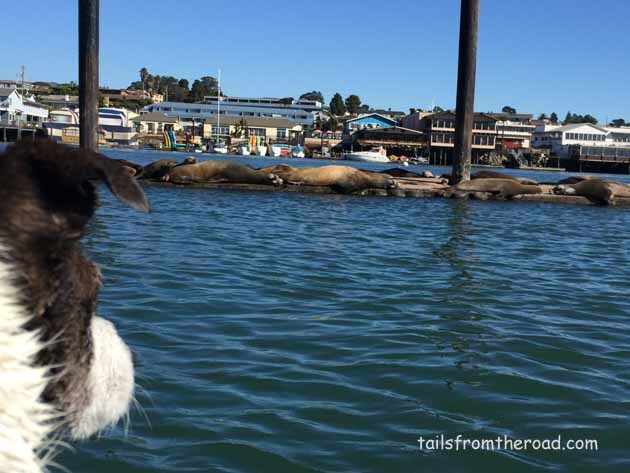 Rent a kayak and paddle around the bay, you’ll see seals, otters and who knows what else. Bike path to the city center. 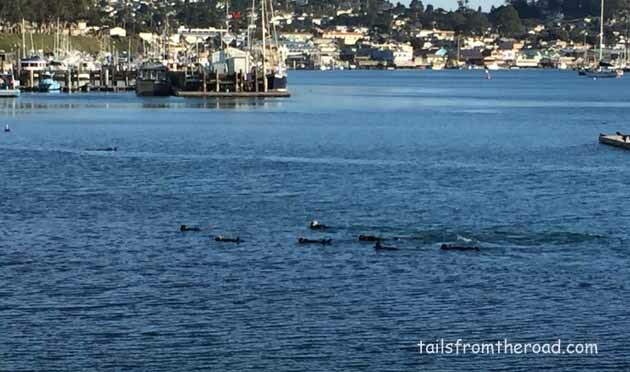 As you walk/ride on this you see otters frolicking in the bay. 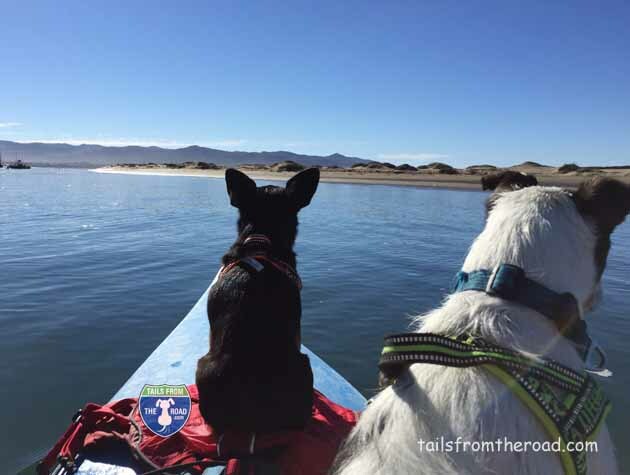 Romeo and Mick on the kayak in Morro Bay. The weather here is kinda the same year round. The locals tell me that the summer (June – Aug) is very busy and the mornings are foggy, every day! The fog burns off in the late afternoon; it’s warm and a bit muggy. We paddled to an sand spit and had a picnic, Mick had a mud picnic. The “to do” attractions in the area are plentiful. 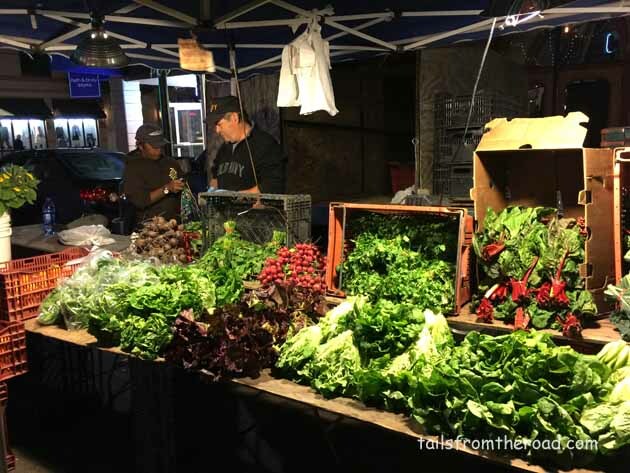 Hit the Farmers Market in San Luis Obispo, every Thursday 6-9pm, its amazing!!! Then you’ll need to go back to SLO for another visit, because it’s a fun downtown. You’ll also find a Costco and everything you need in this city of around 90k folks. Amazing produce year round. Farmers Market at night, that was different. 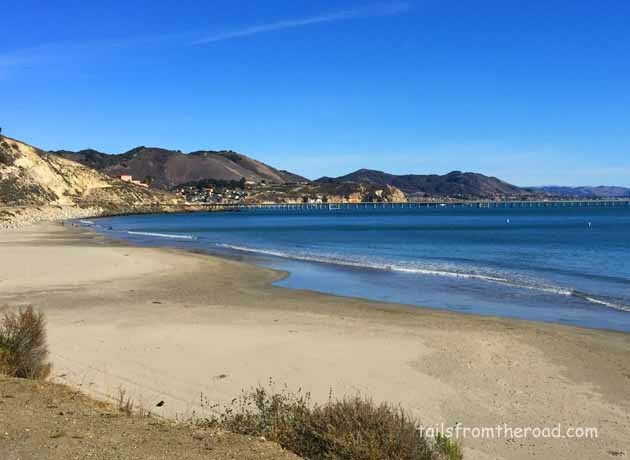 Visit Pismo and Avila beach communities; see the butterflies at the south end of Pismo. 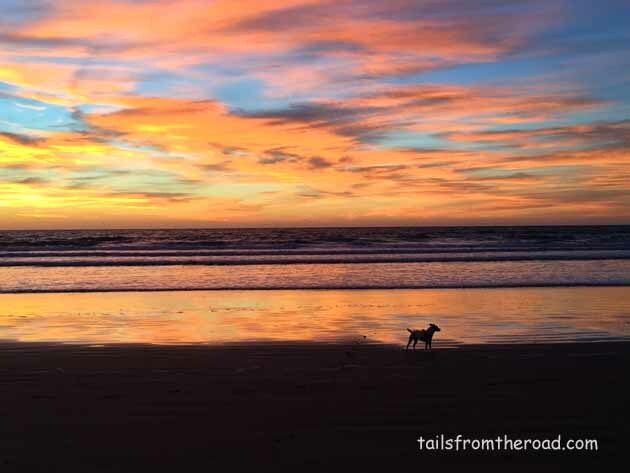 Dogs are welcome on the Pismo beaches, on leash. 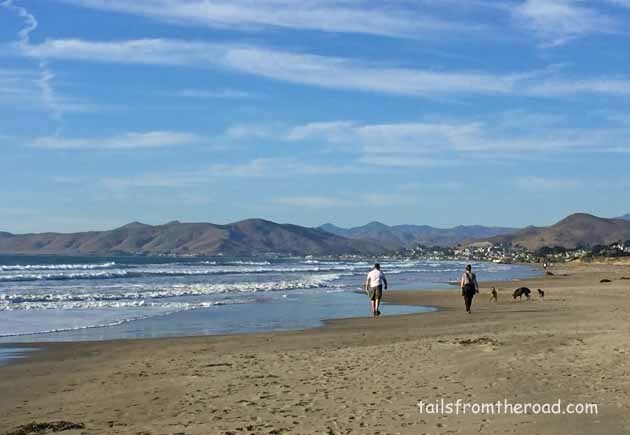 Avila has 2 short sections of leash free dog beaches. The town of Avila is tiny and darling with some restaurants with patios that look out to the beach. Mick & Romeo on a beach north of Pismo. 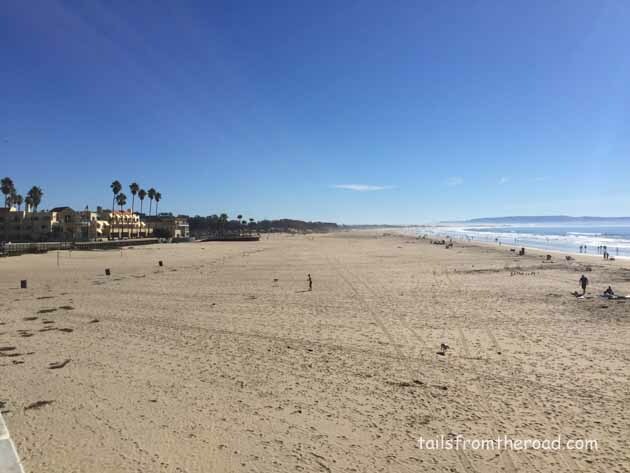 The very large beach at Pismo Beach, this fills up with shoulder to shoulder people. 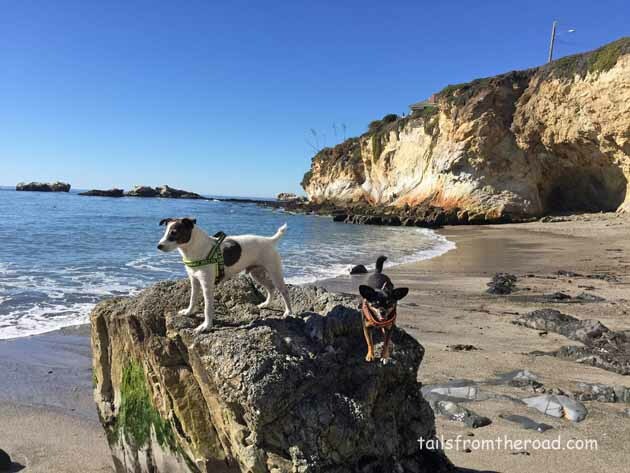 North of Morro Bay is Cayucos, they have dog friendly beach also. Another cute, tiny town. 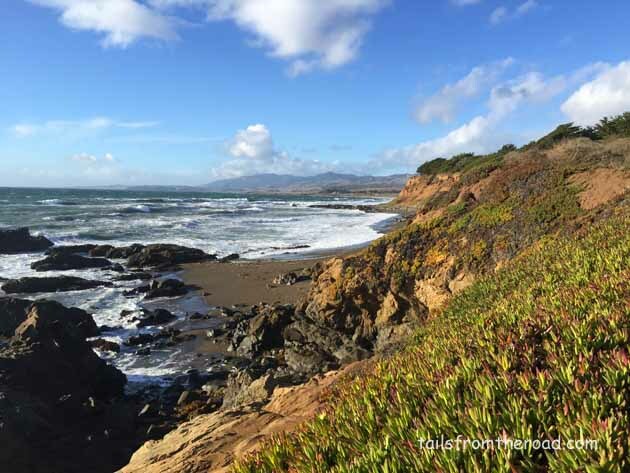 Keep driving north to Cambria, where you can stroll this quaint village by the sea. There are 2 sections to the “downtown”; both are full of interesting shops. 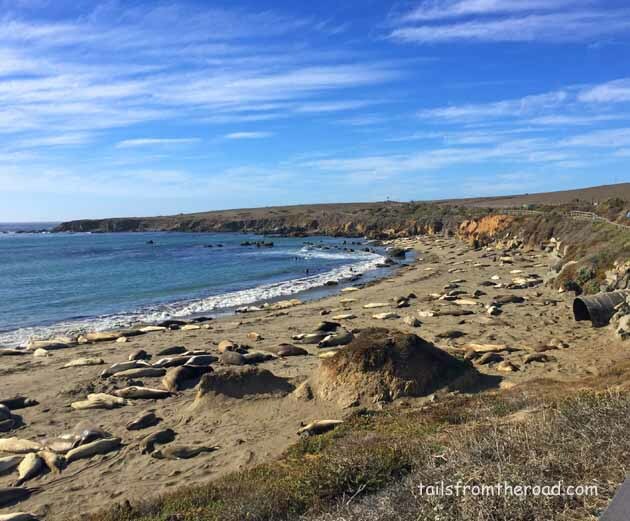 Further north is Sam Simeon, I did not visit this attraction this time (did so with my Father many years ago), but I did drive up just a few more miles and watched the Elephant Seals on the beach. This is a must see! There are docents there 365 days a year and they know everything about the seals. It’s really interesting and I found I could have watched them for hours, the dogs too. Mick was a bit over aroused, but he kept his composure enough that we could stand there for 30 minutes. I felt very fortunate to find The Yoga Center of Morro Bay. This place is rock star in my yoga world. They offer many classes, and are oh, so friendly. Morro Dunes RV Park is expensive compared to the rest of the country, but in California, it’s reasonable, especially for being on the beach. The state parks in California are $50 for a dry camp spot. 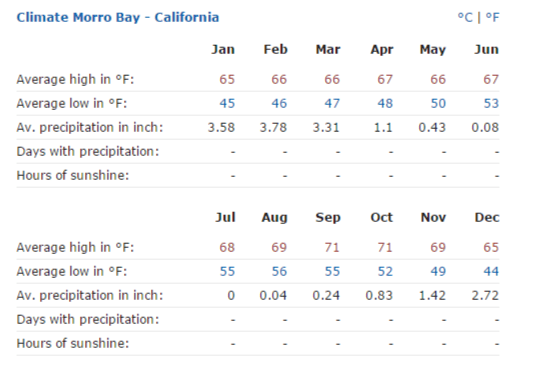 The Morro Dunes is about $48 for a night and $750 for a month Oct 1 – April 1. The Verizon cell service is strong and there are several over the air TV channels available. The RV Park has a very nice laundry facility, showers and an on-site RV repair man that I’ve heard is very good. There is a fenced in dog area, my dogs and I did not like it. To be on the beach in a nice quiet place where the dogs can have fun is golden for me. I loved this area and I will be back. 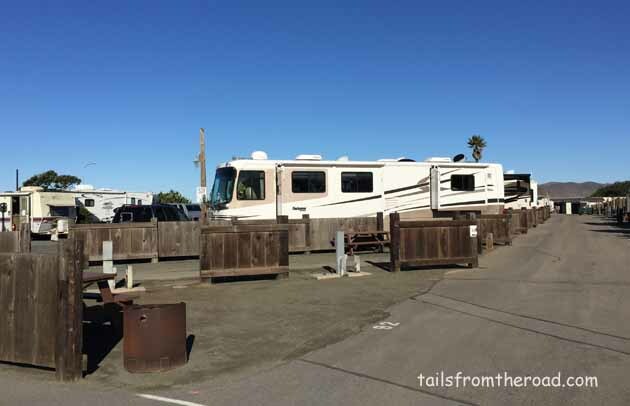 Some folks like the Pismo Beach area and there are a few more choices for RV’s there, it’s a busier area, very busy on the weekends. Avila has dry camp spots right on the water. This is the Port San Luis Camping area. Avila Beach community in the back ground, this is taken from the Port San Luis Camp area. A great place to dry camp. Mick was shaking with excitement seeing the seals so close. Boy, you’ve talked me into it! If I can purchase my RV in time, Sully and I will definitely meet you there next November! Try Bella Vista in Cayucos. Very dog friendly. Winter months are best weather and $. Right across the street is off leash beach. I store a trailer in the park and stay months! It’s a pearl of a beach. Wow, thanks so much Gwen, I really appreciate this tip. Going to look up that park right now and put it on my list. I will be back there for sure, it’s in my soul that place! I’m putting your email in my file with the Central Coast. Will let you know if I am there. It would be Nov or Dec this year possibly. Thanks so much for coming to the blog and the great tips.